Could Jeff Carter Head To the Buffalo Sabres? Let’s face it, Rick Nash is not going to the Buffalo Sabres. With Nash not even playing in a position of need for Buffalo, there’s really no reason why he should, either. If you’re looking for someone from the Columbus Blue Jackets to put on the Sabres, how about Nash’s team mate, center Jeff Carter? Jeremy White of WGR Buffalo produced this tweet early on Tuesday morning saying that if the Sabres want to make a splash at the trade deadline, perhaps Jeff Carter would be the man to look at. It’s certainly an interesting idea, and there’s actually some people who think that Carter may be a better buy overall than Nash, who is unquestionably the biggest name on the market right now. The biggest sticking point with Jeff Carter is the contract, obviously. 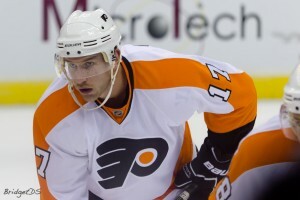 The 26 year old signed a huge contract extension back when he was with the Philadelphia Flyers, one that is still running and is going to continue to run for almost another decade. Even with that contract though, Carter will only be about a $5 million cap hit, a plus for him. Despite being injured this year, his stats in years past have looked quite good as well, especially for the Sabres, a team that has almost nothing right now at the center position. 66, 61 and 84 points his last three years are numbers that would be of immense help to a Sabres team that lacks true superstar talent to provide big gains for them. The Sabres kind of in a tough position right now, teetering right in the middle between wanting to push for a postseason run like they did last year and wanting to just tank it and go for a high lottery selection so they can build their team. Picking up Carter would definitely be a sign that they are looking at the former option. It might be a gamble, but heck if it wouldn’t be a brave move for the Sabres front office to make after their spending spree in the offseason resulted in… well, the results that we’ve seen so far. It’s unclear how much the Jackets would want for Jeff Carter, they spent a very high first round pick and Jakub Voracek to originally get him in the first place. Trade deadline excitement indeed, Jeremy!